The following blog, tells the story of our Paga experience as juniors, in our first year playing ultimate. Created by Dan and Football. *To note: If anybody has any additional stories they would like to add, feel free to write a comment below. We would certainly love to read it. A 10.00 Am wake-up call had the entire hostel in excitement, as finally the first day of Paganello had arrived. Everyone could not wait to hit the beach and play some ultimate. After a grim breakfast, the teams made their way to the beach, practising their side-arms along the journey. With the weather clearing up the day looked promising, a chuck-around, game of 500’s and a few layout drills made its way for the grand finale. A match between Not So Brighton mixed and juniors. Although, the juniors lost it was a good chance to get to know the team and identify its strengths and weaknesses. A particular problem – cutting under when Chris had the disk. A memorable part of the evening was the adventure of going fishing with Ed, Joe, Tag and Miles. Ed’s “monster catch” was the highlight, as well as spending quality time with friends who kept me entertained through what some people might call it “a boring sport”. 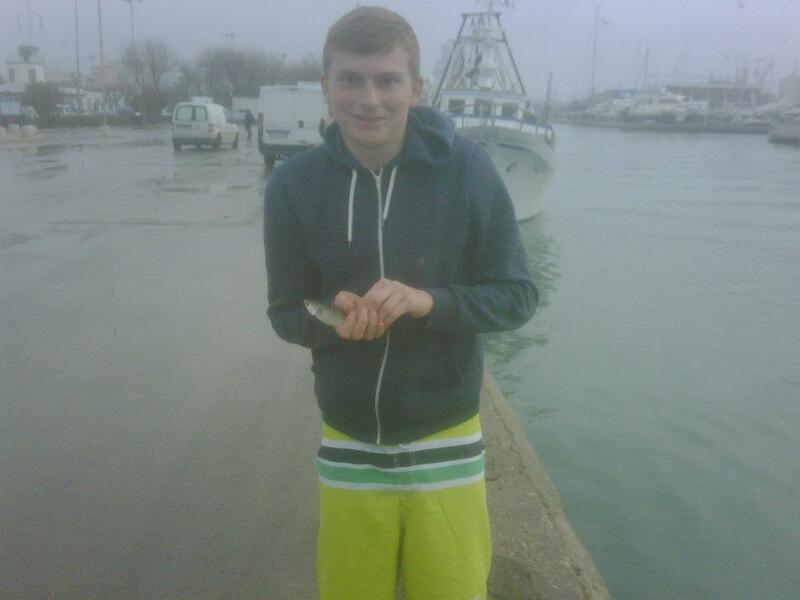 Due to Miles beliefs of not killing animals the fish was not kept and thrown back. The day ended with a stroll around Rim ini looking for somewhere to eat. The town in my opinion was a let-down. It was dead, no girls, nothing to do and a waste of a valuable V- neck. Who would honestly want to live here? After, an expensive meal, the gang made its way to an Irish pub enjoying the festivities it had to offer. Remembering the third day is a good time to ponder on some words of wisdom; “He who intakes a bountiful quantity of liquor generates more memories for himself, yet has more to forget. 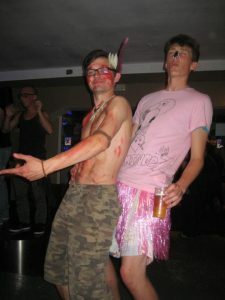 He who forgets more is the likely culprit of the straightened pigs’ tail.” Basically free wine= loads of people getting comically drunk and producing great moments of horseplay, buffoonery and knickerbockery. Football was carried off at one point after spewing a few times, but before this attempted to create some space between Charlie and Lucy, stating to Charlie that he ‘spends too much time with her’. I really enjoyed watching Miles walk off into the darkness, somewhat attempting to do so with purpose but after a few steps stopping, stumbling and crumpling face first. Many experienced a revelation after being told the artist Flo. Rida stands for Florida, where he was born. Jallen made a respectable recovery after spewing midway through the night. Richard the Therapist was in a calamitous condition, luckily for him he’s cared about and was escorted to his room. Sam the Scottish Fairy performed well with around 18 cups of wine and keeping his wits relatively intact. A certain ill-fated event occurred on this night back at the hostel, but this will be kept closed to those who know. 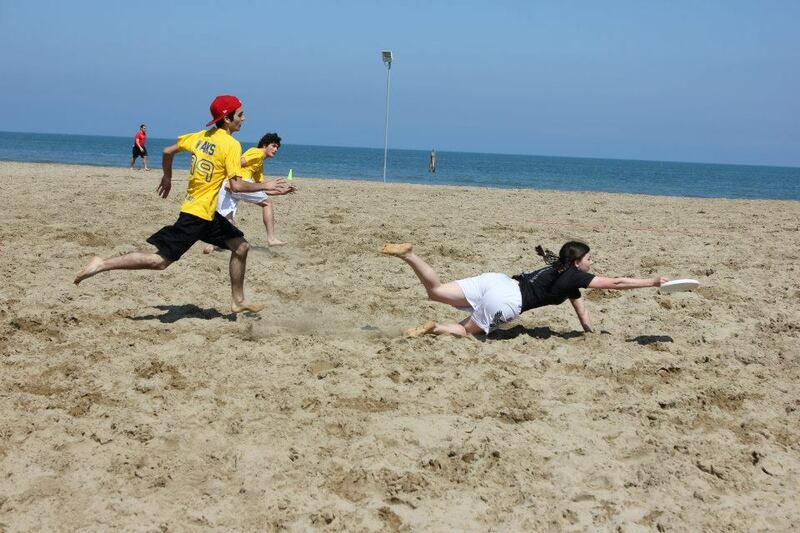 As the hangover began to subside, competitive beach ultimate was finally played. Our first opponents were Faccia da Gialli a local team from bologna. Although, they beat us 10 – 8 it was an incredibly close game. Even with a sluggish hangover everyone gave 110%, Charlie’s incredible throws and Sam’s astonishing D’s contributed massively to the game. Starzy was by far the 2nd best female junior at Paga, from her layout grabs to motivation on the side-line, would not be missed in future games to come. Also, Benjy’s commitment to make sure his cap w as on his head rather than in the sand summed up just how important this game was. Prior to our second game against Cota Rica 2, a female of a rather mature age had made an aggressive move towards Sam. Ed and I stood in astonishment. How the hell does Sam do it? After a convincing loss against Cota Rica 1 (10 -3), the team made its way back to the hostel for a magnificent dinner made by Lucy and Charlie. Despite this day comprising of 3 losses it was a highly enjoyable day in terms of the ultimate played. Personally our valiant effort in a 15-4(?) loss to Triple T was one of if not THE most enjoyable game. There was a build up to this game after the hostel banter and although we knew they were a very good team, we went out positive and hard and considering how much fitter, experienced and knitted as a team they were scoring 4 points was commendable. Our performance against Red Bulls was slightly tame but still an enjoyable game. Catchup bummed us to put it bluntly, but we still shined with spirit and played with grins consistently. With the weather bringing a 2 hour delay, it gave us time to prepare for the match of the day (live). The Cota 1 game was our chance to beat our seed and push through to the semi-finals. Compared to our first loss to them it was a completely different game. We traded points up to 2 -2 in a very intense, very tight game. Sam’s superb hammer to Charlie gave us the lead at 3 – 2 with only 5 minutes remaining. Consequently, we lost 2 points in quick succession. At 3-4, after the buzzer had gone, Cota needed only 1 point to win the match. Charlie had the disk in our end zone, with a high stall count there was no alternative, but to huck the disk to Dan cutting deep. The disk looked as if it was going out, but an AMAZING grab over two Cota players brought the game to sudden death. A time-out was immediately called, we psyched ourselves up. Allot. They scored in about 15 seconds. A bitter defeat to swallow. With the loss of Cota 1, not allot of thought went into the game against Cota 2. After dispatching them 9 -1 the previous day, it looked like this would be a stroll in the park. With the wind picking up and the opponents winning the toss, little did we know what was in store. After 10 minutes, we were 3 – 0 down. The lack of concentration on our apart allowed Cota 2 to break us upwind. Now we were in trouble. Having Chris on a downward point was important, his hucks were pivotal in bringing the game to 4 – 2. Next thing was to break them upwind. The buzzer didn’t help, as now the game was to 5, Cota needed 1 point out of two downwind opportunities. Moving the disk upwind was not fun. Every inch felt like a mile, especially when being forced side-arm. Turnovers were frequent; a repeated process of losing the disk mid-way and getting the disk back at our own end zone. Eventually, we succeeded in breaking them through a series of handle weaves. Celebration was muted, as we needed to do this twice to secure victory. As predicted, a quick downwind point followed to reach sudden death (4 – 4). Unfortunately, our tired legs could not keep up with the pace of Cota 2’s repetitive Huck and D tactics. A marvellous match with great spirit all round. Although we lost our seeding, nothing could take away the valiant effort of the team’s performance. In addition, we had the Paga party to look forward too. Again, a big thanks to Lucy who filled our tummies with pasta and tomato sauce. 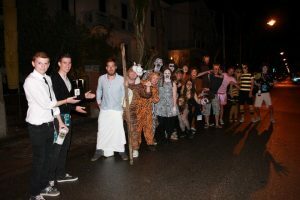 In terms of fancy dress, our idea was to combine with the mixed team and go as Noah’s Ark. Joe used his impressive facial foliage to dress as Noah and the rest went as pairs of animals. Except for Football and Ed, who linked the Zoo theme, with Ant & Dec’s “Celebrity Get Me Out Of Here” (by far the best costume). The party itself was worth the hype, great music and atmosphere. 10 out of 10! The entire Mohawks were having fun. Maybe not Kneetu, but Cake and Longface were definitely taking advantage of the festivities that night had to offer. Football and Ed were not so lucky, walking around in circles trying to find their perfect match. With the party nearing a close there was still time for some late night shenanigans. Stealing advertisement posters, from the main stadium had the adrenaline pumping. Especially, with Benjy dressed up as a tiger, could easily have given away our position. After, being spotted by a security guard the gang legged it with a valuable Gaia sign that will soon be displayed at Russels Clump. Our last game was a predictable easy win against Cota 3, but beating several 12 and 13 year olds is not much to gloat about. Not to forget Benjy’s one inch pull, or Football’s no look backward knife had the audience in laughter. We played every game with exceptional spirit and attitude; we were deserved winners of the Spirit award! Ended the week with a pleasurable meal with everybody at Paganello was amazing and it was a pleasure playing with everyone in Not So Brighton Juniors. A big thanks to Charlie and Ed who organized the trip and captained the team amazingly. This is brilliant. Reading this definitely made me remember how much fun Paga was! It was supposed to be a massive I-O sidearm. I maintain that if the ground wasn’t there then it would have been. 1 inch? Luxury! In my day we had Evil’s pull that ended up out the back of the endzone. OUR endzone. I haven’t even finished reading this yet, but Sam drawing in the laydeez from the first day made me laugh so much! Haha this is amazing and definitely has Football written all over it!! I was struggling not to laugh aloud in the library, but did get a few funny looks!! Really well done guys, you should both take up a career in comedy writing! This is hilarious and yes it definitely does have Football written all over it! Why no mention of the fake tan? Football’s V-neck is only half of the ‘package’. Haha wish I was there to witness the Carolyn & Frank act it must of been insanely funny to watch. And I remember the Glitter Bomb lady, I was surprised she could keep her distance. Loving the slight Football bias and some classic commentary but very good blog, roll on Paga 2013!